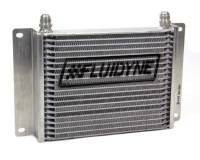 Fluidyne is a manufacturer of innovative cooling products for a wide variety of cooling applications. Check out the Recently Listed Fluid Coolers. Check out the Recently Listed Radiators. Fluidyne Legends, Dwarf Car Oil Cooler - 16" x 10.5" x 1"
Fluidyne Therm-HX„¢ Engine Oil Cooler - 14.75" x 9.25" x 2.5"
Fluidyne Therm-HX™ Engine Oil Cooler - 14.75" x 6.25" x 2.5"
Fluidyne Therm-HX™ Engine Oil Cooler - 14.75" x 9.25" x 2.5"
Fluidyne Therm-HX™ Engine Oil Cooler - Diminsions: 21" x 5-7/8" x 3"
Fluidyne Transmission, Rear End Cooler - 11" x 4" x 2"
Fluidyne Transmission, Rear End Cooler - 11" x 6" x 2"
Fluidyne Transmission, Rear End Cooler - 11" x 8" x 2"
Fluidyne Transmission, Rear End Oil Cooler - 14.75" x 3.00" x 3.00"
Pit Stop USA is The Online Motorsports Superstore! Fluidyne is a manufacturer of innovative cooling products for a wide variety of cooling applications. 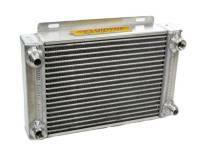 These applications range from high output fans, all-aluminum radiators, water-to-oil heat exchangers and aluminum oil coolers to rear end and transmission coolers. Fluidyne is registered to ISO9001 and QS-9000 International Standards for quality systems. Fluidyne is committed toward continuous improvement, quality control, and customer satisfaction. Fluidyne operates two diverse Product Groups to provide solutions to any customeras cooling needs. Fluidyne Racing Productsa sales and fabrication facility is located in the heart of NASCAR country in Mooresville, NC. FRP provides pioneering cooling products for the racing industry with the most advanced technology in cooling and cooling accessories. Fluidyne Racing Products has visited winner circles in every type of racing from NASCAR Sprint Cup, NASCAR Busch Series and NASCAR Craftsman Truck Series to the World of Outlaws, NASCAR Grand National, SCORE, Toyota Atlantic, I.M.C.A. Modifieds, NASCAR Weekly Racing Series and Legends Racing Series. Fluidyne High Performance is located in the "Street-Sports" capital of the world, Southern California. The High Performance Group targets the popular High Performance Aftermarket and "direct-fit" all aluminum radiators and oil coolers for leading U.S. and Import High Performance Platforms. Both groups are committed to providing state-of-the-art fluid cooling technology. Fluidyne invites you to "Experience the Possibilities". We feature Fluidyne Therm-Hx Heat Exchangers, Fluidyne ZR-1 Coolers, Fluidyne Legends Coolers, Fluidyne Therm-Hx Engine Oil Coolers, Fluidyne Import Radiators, Fluidyne Specialty Oil Coolers, Fluidyne Rear End Coolers, Fluidyne Transmission Coolers, Fluidyne Power Steering Oil Coolers and Fluidyne Dwarf Car Radiators at low everyday prices.